One of our very own "mindful children," Makenna Sherman, was diagnosed with juvenile rheumatoid arthritis in 2010. On Saturday, May 5th, a group of Mindful Mothers joined the "Moving for Mak" team in the Central Coast Arthritis Walk at Lake Park in Atascadero. 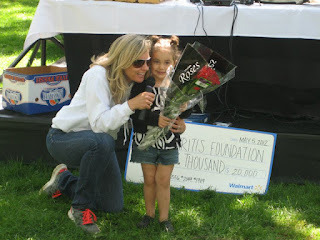 Makenna was the walk's "Youth Honoree" and raised over $5000 to help fund the mission of the Arthritis Foundation, which is to improve lives through leadership in the prevention, control and cure of arthritis and related diseases. Way to go Mak!